On a Thursday afternoon, I noticed a note from Andrea, that Eric and Rob would be in town to run their 50th state (in Washington) and checking in if I wanted to join them for dinner. 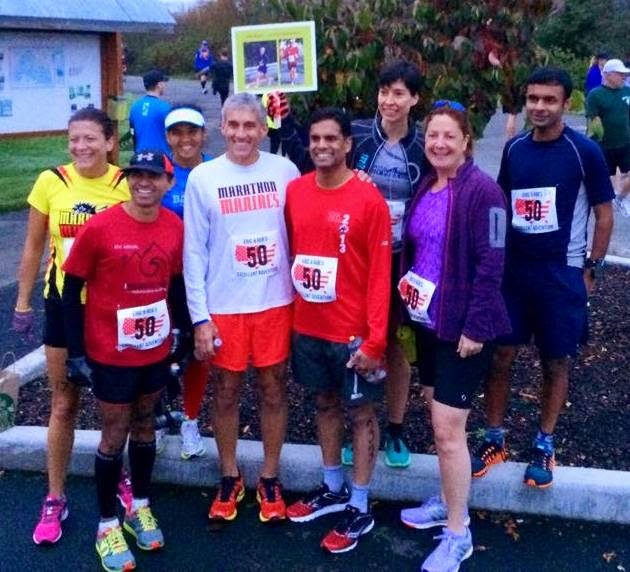 Running a single marathon is a difficult but being able to run one in all 50 states is a HUGE accomplishment. 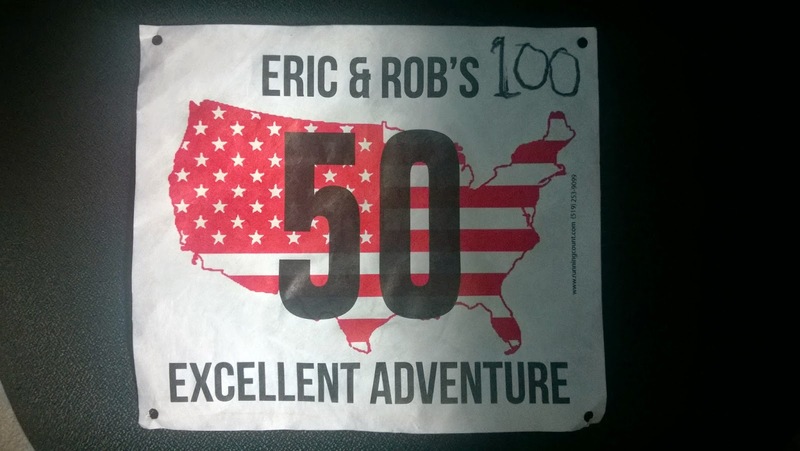 I had run some of the races as part of Eric's journey here. Of course I would make it for the dinner. There would be others coming down to be part of the event. I also wanted to partake in the actual event. Then a thought struck me - why not just run the race? The half marathon - no, I needed to get in 20 miles so it would be a pain to add in another 7 miles. So the full? Hmmm... I had promised myself I would not do stuff like this again. There is no such thing as a running a marathon as a "training run". Running 26.22 miles DOES impact your training IF you are human. I emailed the race director and asked him if I could still run the race. He confirmed I could. So I had committed to running this race. I would not be tapering for the run with 71 miles in the seven days preceding the run. 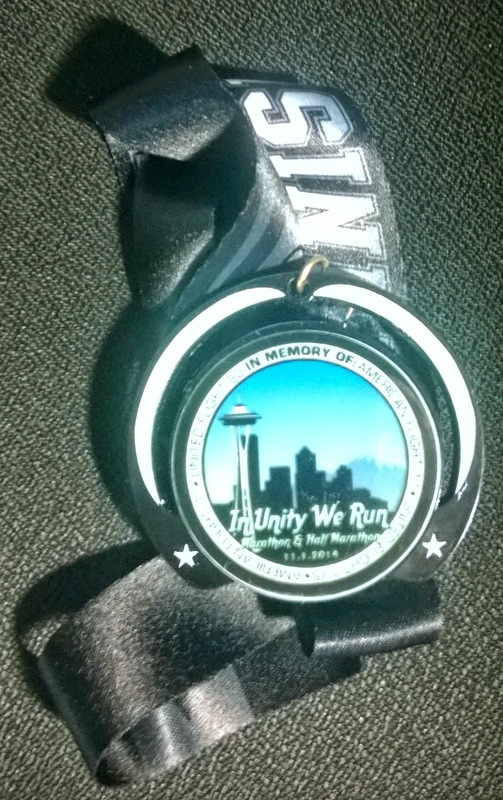 The "In Unity We Run Marathon" is a no frills race in Kent on the Green River trail. By no frills I mean no frills. There was no entry fee but a $10 race donation was recommended and they were also collecting used shoes for the Girls Scouts to send to developing countries (I chipped in a couple of pairs). Of course there was no T-shirt but the race director did promise that he had a cool medal. Goodness - when you run 26.22 miles, you want a medal! You had to bring your own water bottle. There would be water and Gatorade in three points on the course.This was different from my previous marathon in Berlin in every conceivable way. Yes, the world record would not be set here but it was a certified course. There were about a hundred and twenty odd folks who had signed up to run the marathon and a few more to run the half. We were to convene in the Old Spaghetti factory in Tukwilla for our pre-race meal. What a great choice! Eric and Rob's family were there as were the others - a great group. The marathon did not have bibs so Cathy has made special bibs for everyone to mark the occasion. It would end up being so cool to see all our peeps at different points on the race course wearing the bib. Eric also had special Ts for us to mark the occasion. Morning of the race... What a luxury to sleep in your own bed the night before and not have to worry about getting to the start hours before. I slept till 6am - the race began at 8pm. I've been having a difficult time motivating myself to get up in the dark so this race was a good forcing function to get in my run for the day, in time. I began driving to the race start at 6:45 am. I did get into a minor bother finding the race start at The Three Friends Fishing hole. It was in an industrial area. I tried asking someone in the area about it and he looked at me as if I was asking him for directions to the moon. Luckily, I noticed a couple of runners getting in a warm-up run and then saw a bunch of cars parked in the parking lot. I checked in and dropped off my pairs of used shoes. I had the race number 100 which had to be a good sign! I ran into Anu and Nagesh who had reached late the previous night. There was time for a group picture before we were off. The weather was perfect for running - 47F and cloudy. We had lucked out with a dry window amidst a period of prolonged rain. I was actually feeling a little cold in the morning. That is usually a sign that you're dressed correctly - too comfortable at start means that you'll heat up once you start running. At 8 am we started running without any fanfare. The half and full marathoners would be running together for the first half. This was goodness - there were others to run with! Running through roads leading up to the Green river trail. I passed Eric who was in his zone with headphones. 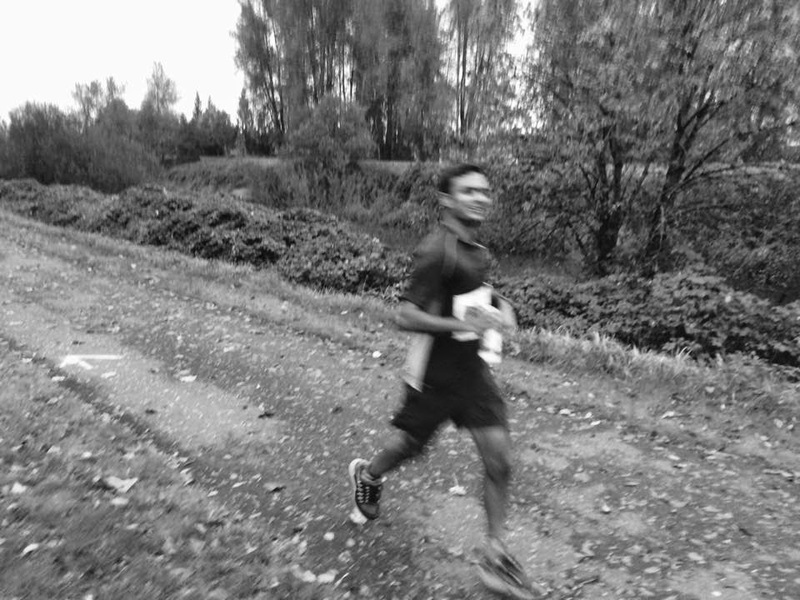 Nagesh was out in the front. I also passed someone else from SGLRG. My legs were loosened up and I picked up the pace a bit. I didn't plan on taking any gels as I would have in a marathon that I was actually racing. Passed an empty golf shooting range which was around about the only memorable thing on this part of the trail. I was running by myself. It pretty much felt like a long run on the Lake Sammamish trail. Just that here the river was to my right and not the left. Similar houses. It was here that I saw the first runner from the turn-around. Rob would pass by shortly. The turnaround was at 6.57 miles. I didn't stop to refill my bottle of Gatorade. I had enough to keep me going for a bit. Keith (Andrea's husband) took this artsy pick of me on the move. It was nice to have other runners on the other side. I got to see the other SGLRG runner and her boyfriend who shouted out "Greenlake!". Eric was a little behind. Then Anu, Andrea and Cathy. I was feeling pretty good and picking up the pace. I hit a shoe lace opening epidemic - when your shoelace keeps on opening and you have to stop to retry them only for them to open up again. We got back onto the roads. I saw Nagesh in the distance. It gave me a target to catch-up to. I caught up with Nagesh only for my shoelaces to open up yet again. Thereafter, each time I'd get near him he'd take off like I was chasing him with an axe :) Later he mentioned that he was determined not to let me get past him. I got to the half in a little under 1:40... The half runners turned to their finish and I proceeded on. I stopped at the waterstop. I drank a cup of water (yes there were cups!) and proceeded on. This was a horrible part of the race. The Green river trail was closed for construction so we routed through the roads and the industrial areas. The only thing that kept me from getting lost was a runner up front and the red chalk marks that they had on the pavement. My legs weren't feeling as good as they had a few miles ago. I then got to a point where the runner up-front and two others had gone off track and were not sure where to go next. After a brief detour we did get back on track and onto the Green river trail. Most of the folks running the full had gotten off track at some point, including the winner (Rob). We crossed a neat looking bridge and got onto the Green river trail. The three guys (who would end up finishing in front of me) began following me. One guy in particular was shadowing me very closely. He was a bit irritating since he was kicking sand into my shoes. If I moved he would move behind me! I picked up the pace here primarily with the goal of dropping my shadow :p It was a nicer part of the trail. We passed a soccer field bustling with activity. I was ready to reach the turn-around. There's quite something about making your way back on an out-and-back. Saw Rob in the lead but he wasn't that ahead of us. We got off the trail and again it became critical to follow the arrows. The guys behind me had now moved ahead. I stopped at the water stop to take a cup of water and also filled my bottle. The marathon runners were a bit more dispersed so it meant that I saw runners all the way to the finish on the opposite side. That was useful as a course marker and helped me stay on course. I discarded my bottle. It felt good to be able to use both hands as part of my running form. Back to the dreary section off the trails and onto the pavement. Had this been a race where I was giving it my all this would have indeed been painful. I really did not want to get lost. I ran on the pavement so that I could carefully follow the arrows. There was another runner in the distance. I made sure I had him in my vision. This was mental tax that is not the most fun but is what you're signing up for in a no-frills race. The solitude can be welcome for some and running all kinds of races gives you a more well rounded and unique experience. The finish. I finished 5th overall. The race director and all everyone from the Rob and Eric celebratory party was present. Rob had won the race. Eric would finish around 25 minutes after.